Does your skin really need that heavy moisturiser? Our skin goes through a natural cycle of regeneration, whereby we shed dead skin cells, to be replaced by newer cells from the deeper layers. However, when we moisturise, we are actually delaying this regeneration. If your skin really feels dehydrated, you will possibly benefit more from taking a good quality fish oil. Drink plenty of water. Eat a nutrient rich diet with a variety of vegetables rich in colour .Eat oily fish. Moisturising also disrupts the barrier function of the skin. The skin is an important organ which provides protection against UV radiation, heat, toxins etc.Moisturising lotions (which are water-based) or creams and oils (lipid based) can disrupt this water/lipid/ balance. The result is an over-saturated layer which is less effective as a barrier, such that the skin feels tight and sensitive after washing. There is a reduction of both Natural Moisturising Factors (NMF’s – naturally occurring chemicals in the skin which absorb water from the atmosphere) and Glycosaminoglycans (GAGs – the skin’s own moisturiser produced by the fibroblast cells deep in the skin. Lots of Clients suffer from too much sebum/ oil, which is an inflammatory agent. 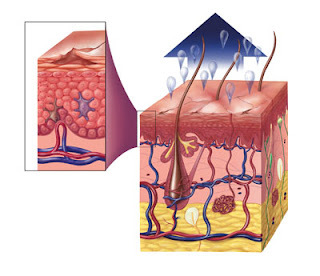 Acne and rosacea are two oil-related conditions. Moisturising creams can aggravate these conditions, causing the skin to produce more oil in response to a heavy cream on the surface. Daily moisturising over a prolonged period may actually age the skin. This occurs because the fibroblast cells which produce GAGs (the skin’s moisturiser) also produce collagen and elastin, which help maintain the skin’s elasticity. If we make these fibroblast cells sluggish, due to an impaired mechanism, this compounds the decline in production of collagen and elastin which is already occurring with ageing. Give your skin the opportunity to recover, if you are using a heavy cream, try switching to a lighter lotion. If you are moisturising twice a day, try reducing this to once only. You may well find that using an antioxidant serum and an SPF provides sufficient comfort after cleansing in the morning. 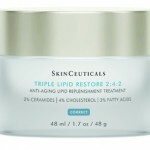 Yes there are clients who need to use a moisturiser to soothe the skin - to assists with healing and put back what we loose naturally as we age #Skinceutical Triple Lipid Restore 2:4:2 contains an exceptional mix of ceramides, cholesterol, and fatty acids, all essential to replenishing skin's surface and protecting against moisture loss. These ingredients excel at improving chronically dry skin whose surface is compromised due to various circumstances (like health issues, sun damage, or extreme environmental conditions).The ingredients mimic the natural substances we have within our skin so aid in replenishing the skin as we age.